The great pop singers of the Golden Era delivered an emotional wallop powered either by the compression of anger or the sublimation of despair. Usually men were in the first category and women in the second—Sinatra and Garland, archetypally. Streisand defied the pattern. Her subtext has always been the fury of the kooky, odd-looking girl getting revenge by asserting her own kind of femininity—and trying to move the culture toward her instead of the other way around. This is an exciting time for Barbra Streisand, one of the 6 women recently chosen to be part of the National Museum of American Jewish History's "Only in America" hall of fame exhibit. 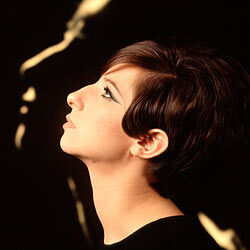 Streisand continues to amaze us, and I know I'm not the only one wishing I could attend her show at the Vanguard. To learn more about Barbra Streisand's incredible career, check out her entry in Jewish Women: A Comprehensive Historical Encylopedia. Berkenwald, Leah. "The "fury of the kooky, odd-looking girl"." 22 September 2009. Jewish Women's Archive. (Viewed on April 23, 2019) <https://jwa.org/blog/streisand>.